Being a member of the Erasmus Generation can be a transforming experience. By participating in ESN's projects like SocialErasmus you become an active citizen, contributing to building up a better society which improves the lives of your fellow citizens all around Europe. However, active citizenship also means active democratic participation - learn more about how that can change the situation around you for the better. 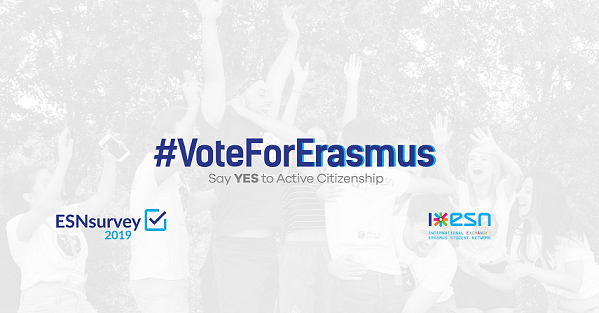 During the fall of 2018 and spring of 2019, ESN is involved in two projects on the topics of active citizenship and democratic participation: Erasmus in Action and Erasmus Participation in Elections. An important aspect of the latter is the ESNsurvey 2019. The European Parliament (EP) elections in 2019 will take place all over Europe during 23 - 26 May 2019. In the last EP elections in 2014, Erasmus students were much more likely to vote in the elections than their non-mobile peers, according to the Erasmus Voting Assessment. If you are interested in learning more about the EP elections, please register at the This Time I’m Voting campaign below! Every member state is partially free to choose their own voting system which can make it really hard to find out how to vote, especially if a person is not living in a country where they have citizenship. Thanks to the How To Vote website or app (Google Play/App Store), you can find information based on your nationality and your current country of residence. This tool is currently being crowd-funded. If you feel like contribute to this, don't hesitate to do so. You can find more information about it here. Want to learn more about the elections? Visit YourVoteMatters.eu to get to know the Members of Parliament, their views, and stay up to date with the news regarding EP elections. The Match your vote quiz will help you to see which politicians, national parties and EU political groups match your views based on their true actions! "Young people are lazy and entitled.” we hear everywhere. Let’s prove those voices wrong! The Erasmus Generation is a generation of active citizens. Let’s together decide on the future of Europe! Tell us if your exchange has made you a more active citizen and fill in the ESNsurvey 2019! Act as an Ambassador and organise your own event in your host-country to spread information. This is your chance to engage in European democracy. Thanks to your efforts, more people will know how to participate in the elections! If you’re a citizen of an EU country, then you’re also a European citizen and the Citizens' App is what you were looking for. By downloading it, you’ll learn who does what in the EU, how all of this is relevant to your daily life and what challenges the EU faces, many of which will shape your future. The app made for and by citizens. In October 2018, we organised a discussion on active citizenship called Citizens' Dialogue, where many young people could debate with various EU decision-makers, including a Member of the European Parliament. You can watch the stream below or read more about this initiative in our article.